President Mahinda Rajapaksa told Lal Wickrematunge three times that his brother Lasantha, the founding editor of The Sunday Leader newspaper who was assassinated in January 2009 was killed by Former Army Chief Sarath Fonseka, exiled Sri Lankan Journalist Uvindu Kurukulasuriya told UN Human Rights Commissioner Navi Pillay in London yesterday. Pillay who delivered a lecture at the London School of Economics and Political Science (LSE) on Friday on the Freedom of Expression and Hate Speech: What International Human Rights Law Says was informed of this publicly by Kurukulasuriya following her speech. Kurukulasuriya said that Lal Wickrematunge had informed him that President Rajapaksa had divulged Fonseka’s hand in Lasantha’s murder three times and he had responded that if so, why the former Army General was not being prosecuted if that was the case. He said Lal Wickrematunge had wanted this conveyed to the UN Human Rights Commissioner when it was possible. Pillay responded that she gets thousands and thousands of complaints and is very concerned about human rights defenders. “Legitimate speech is threatened by certain governments and we are looking for measures to expose these practices and find solutions,” the UN High Commissioner said. Sunday Leader Journalist Faraz Shaukatally was shot by an unidentified group last night. He was admitted to the Kalubowila hospital. Later at the dinner, Uvindu handed over a copy of Lal Wickrematunge’s letter to Navi Pillay for further investigation, the Colombo Telegraph learns. 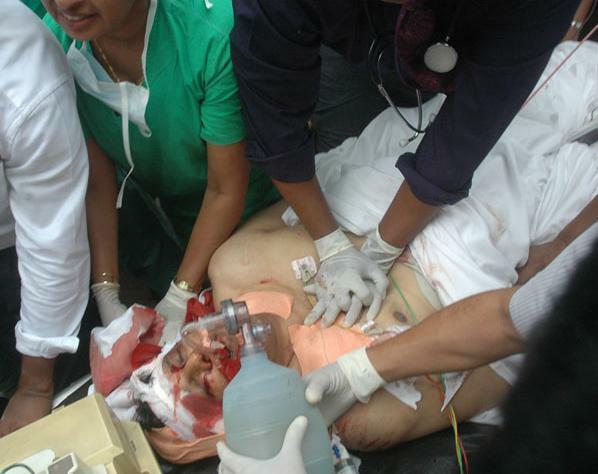 Lasantha Wickrematunge was killed on the way to work on January 8, 2009 in Colombo. His killers were never apprehended. Just another stunt by that attention seeking ego maniac – Uvindu ! “Three things cannot be long hidden: the sun, the moon, and the truth”. Sharmani you are very correct.Truth will come out one day.My worry is will the offenders get justice.? That is my worry too. There was a very unusual participant at last month’s Black Friday which marks the event where journalists were killed, abducted, assaulted and intimidated years ago. Lasantha was murdered in broad daylight. Namal Perera, a free lance journalist and Mahendra Ratnaweera Political Secretary of the British High Commission were severely assaulted. There were other leading journalists who were in the hit list. Assassinations were planned and they fled the country. Some are out. Others have come back. Who is this participant? It was none other than General (five star) Sarath Fonseka VSV psc etc etc. When he was presidential candidate, he was even at the ceremony to remember Lasantha. The Government could not nail him. The reason – the key witness who knew all this and assigned people did not consent to spill the beans. He was offered money and plum positions. He refused. The man who was serving in uniform overseas was recalled and that the last he was heard. He is no in an insiginificant position. and carried out operations has gone quit. The plot hatched in Manning Market will one day come out. Even Lasantha will not look lily white when it does. Lal is well known for what he is. Mlinda is right. Navi Pillay really has shot herself in the foot, jumping to the conclusion that the shooting of Faraz Shaukatally was necessarily related to his work as a journalist. There is no evidence – only suspicion – to support that view. Clearly, this lady is not competent to hold the position she holds if her judgement can be so easily based on suspicion and gut feelings. Someone in her role needs to be objective and sound of judgement and to think before she opens her big mouth. I refer to the letter written by Mr. Wickramatunge and delivered to Ms. Navi Pillai, UN High Commissioner for Human Rights, through Mr. Kurukulasuriya in London. Since we will be circulating this letter to the general public I am adding the link to the article published in the Colombo Telegraph, hereunder, for reference purposes. According to the above letter, President Rajapaksa has told Mr. Lal Wickramatunge, not once but three times, that it was Gen. Sarath Fonseka who was behind the murder of late Mr. Lasantha Wickramatunge! A few hours after the article was published two retired officers from Sri Lanka Police, currently living in Europe called me to reveal some startling facts about the murder of Lasantha Wickranatunge , and what the government did and did not do to resolve this murder. In fairness to the chair of the president of Sri Lanka, I gave the presidential secretariat time to dispute Mr. Lal Wickramatunge’s claim. 72 hours have lapsed and there is no clarification so far from the President’s office and perhaps just as he accused Gen. Fonseka and his campaign team of an armed uprising after the presidential elections in 2010, I am compelled to believe, that he had indeed told Mr. Wickramatunge this story about Gen. Fonseka. I am thankful to those two retired officers for calling me and giving me the opportunity to reveal the facts behind the assassination of Mr. Lasantha Wickramatunge and at least this account will establish that the government clearly persecuted Mr. Lasantha Wickramatunge. I sincerely hope that the senior officials of the CID at that time would now come forward and tell the world how unusual it was for the murder investigation of Lasantha Wickramatunge to be carried out by the TID instead of the CID! Below is the account of the events surrounding Lasantha Wickramatunge’s murder as related to me by the two ex police officers, who were not aware of each other’s calls to me, yet they corroborated each other’s accounts. a) During early morning hours of December 21, 2007, a group of people carried out an arson attack on the Leader printing press. No suspects were ever found but some strange events took place during the subsequent months. Superintendent of Police Edison Gunathillaka who was in charge of the investigation was promoted to the rank of DIG over many other senior SSP’s and within the same year was made a Senior DIG. The senior police officers believe that he was rewarded by the government for protecting the perpetrators! b) In 2008, after a critical coverage of the president of Sri Lanka appeared in the Sunday Leader newspaper, the president of Sri Lanka called Lasantha Wickramatunge and shouted at him using obscene words unbecoming for a leader of a nation. The president threatened Lasantha that he would be killed if the coverage did not change. A recording of this conversation exists. c) In 2008 Gotabhaya Rajapaksa filed a defamation lawsuit against the Leader newspaper for a series of articles reporting improper arms deals by Gotabhaya Rajapaksa. When these articles appeared Gotabhaya Rajapaksa has asked the CID to take Lasantha Wickramatunge into custody. The veteran CID officer Mr. Sisira Mendis who was the director of the CID and DIG Asoka Wijetillake both knew that there was no provision for them to detain Mr. Wickramatunge and they officially sort a directive from the Solicitor General, Mr. C.R. de Silva who informed them that it should not be done. When this was conveyed to Gotabhaya Rajapaksa he had been very angry and stated “Well, I have people who are prepared to do this.” Fearing that the government might kidnap and kill Lasantha Wickramatunge, the CID decided to take him into custody and one of the officers who respected media freedom informed Lasantha when he would be arrested and to be prepared for it. Lasantha Wickramatunge gathered a large group of journalists and was awaiting the arrival of the police but after being informed of this development, Gotabhaya Rajapaksa recalled the police party already on the way to Lasantha’s place. d) Gotabhaya Rajapaksa realizing that the information leaked out of the CID, transferred almost all the officers of the CID, including the Director Sisira Mendis. He was subsequently brought back to the CID on the insistence of the IGP. f) The most strange event took place at this stage. The investigation of Lasantha’s assassination was handed over to the TID (Terrorist Investigation Division) without summoning the CID, which was the standard practice. The TID had no experience in investigations of this nature and they remained passive for almost 6 months, according to the CID, killing evidence and leads that may have helped them to solve the crime. (It was the CID under Sisira Mendis who tracked down the terrorists who took part in the airport attack. A tiny clue found on two pieces of paper was cleverly put together by the CID to find a telephone number that finally directed the detectives to the culprits.) Overlooking all these achievements of the CID, the investigation was handed over to an alien department. Finally, if the government had proof of General’s involvement in this assassination, they would have definitely used that evidence to lock him away forever, without concocting stories about white flags, armed uprisings or doing politics while in uniform. The question is – why are these allegations leveled now? The couple of months ahead are really critical for Sri Lanka. UNHRC is preparing to grill us again. IMF has refused to lend us any more money to support our budget. Last night the European Union confirmed that they will support the resolution against Sri Lanka. This resolution originated in the United States and we did not muster proper diplomatic efforts to nip things at the bud. It is rather unfortunate that mission here, perhaps the most important capital in the world, is manned by a person to whom ignorance is a bliss! It looks like the Commonwealth summit will not be held in Sri Lanka although government sponsored media is trying to portray a divine outlook of our country and the family presiding over her populace. We all know that Duminda Silva will return to Sri Lanka soon and will be pardoned. Mervin Silva will never be punished for committing murder. Our Executive systematically controls every organ of governance, especially the Judiciary, reminding us of Nazi Germany under Hitler. Do they want to detain General Sarath Fonseka again and start an international media circus? It certainly does remind me of the burning of the Reichtag and Giorgi Dimitriov. Sanath de Silva, On behalf of the silent majority I thank you for your effort. People like Malinda, Dayan and Rajiva supported all the corrupted regimes from Hitler to Polpot, not to undermine their part. It would be extremely unlikely that those running the Leader at time of the presidential election had not heard rumours of Fonseka’s involvement in Lasantha’s death. Nevertheless, the paper supported Fonseka’s presidential campaign. During the White Flag trial, Frederica Jansz, the then editor of the Leader, said that she had directly asked Fonseka if he knew who had killed Lasantha and could not get him to give an answer. This did not come out in Jansz’s answers under cross-examination in the High Court. On the 6th of October 2010, according to the Sunday Times (October 10 2010), she said she went to the interview with Fonseka accompanied by a “trainee reporter” (she denies this, saying it was Raknish Savan Wijewardene, a journalist at the time and not a trainee), a photographer and Lal Wickrematunge , chairman of Leader Publications (Lasantha’s brother). The “trainee journalist” had “taken down notes of the interview, except on the question about the ‘white flag’ issue”. At one point, [Lal] Wickrematunge had asked Wijewardene and the photographer to leave as he wanted to raise a personal issue with Fonseka. Lal asked Fonseka who was responsible for killing Lasantha. Jansz said in response to questioning in the High Court that she “did not pay attention to what was said by Fonseka in response to that question”. Ms Jansz is a very experienced investigative journalist who over the years has been the scourge of many a corrupt businessman and many criminals. Her paper had been running a long campaign to bring to justice the killers of Lasantha. Lasantha’s brother directly asked a man linked with the crime who killed his brother and Frederica drifted off like a distracted teenager! She said that she normally did tape recordings of interviews but the paper’s recorder had been given to someone going to interview the Western Provincial Council minister. Did the paper’s budget not run to buying a second recorder? Was the interview with the provincial minister more important than an interview with a presidential candidate who was accusing his own soldiers and government of a war crime and who was also suspected of involvement in the murder of the paper’s editor? THIS IS AN ATTEMPT TO ‘WHITE-WASH’ BY THE ‘WHITE-VAN’ MAN ! !